2.3 Cahn and Vitrano, "Living Well"
2.6 McMahon, "Chapter 1: The Highest Good"
6.2 Haybron, Chapter 2: What is Happiness? 8.1 Arglyle, "Causes and Correlates of Happiness"
9.2 Diener and Suh, "National Differences in SWB"
10.1 Haybron, Chapter 3, "Life Satisfaction"
10.2 Short Writing Assignment due this Sunday at midnight! 17.1.1 Option 3: Gratitude and Journal. 19.2 Csiksentmihalyi, Chapter 3, "How We Feel When Doing Different Things"
22.2 Johnson, Fenton, "Going It Alone"
25.1 Major Philosophical Options on the "Metaphysics of Death"
28.2 Bruni & Zamagni, Chapter 1: What is Civil Economy? 28.3 Bruni & Zamagni, Chapter 6: Why GDP is not enough? 29.1 Frey and Strutzer, "Policy Consequences of Happiness Research"
Some values of anonymity / non-anonymity in developing philosophical skill. Note on finding audio. In each class day's notes. Note on finding old class notes. At bottom of main wiki page. prep cycle -- check out "focus" notes on reading list, read, come to class, follow study questions from class, make notes in light of class, repeat. Note your responses to things in your notes so that you can go back and collect them for the My Philosophy of Happiness paper. Mark or note your readings so that you can answer study questions for use in short answer (Q&W) exercises and essay exams. Example of Phil Saltman: Does happiness require maximizing accomplishment? Can unhappiness be associated with resignation from challenge? What is the relationship between happiness and achievement? Between happiness and using your talents? Is it an option, a favored option, a necessity? Raises the question of criteria for living well -- How might it be true that happiness and realizing our nature are related? unrelated? Is the Greek Classical model of happiness (as seen in the Symposium and Aristotle's thought), a revelation of truth about happiness or the beginning of a repressive line of thought in happiness studies? If happiness requires a disciplined practice, how do you maintain solidarity with those who do not maintain the discipline (the Alcibiades problem)? Possible weakness of an individual enlightenment model of happiness. conceptual analysis of subjective and objective in Vitrano; think of this as a basic dimension of theoretical space for happiness. Do you have to achieve your goals to be happy? Do you have to have goals to be happy? What is your analysis of Jane's situation? What does it mean for our theory of happiness that there is happiness among the poorest people of earth and that cultures model happiness in significantly different ways (radically diff balances of PA/NA as in the Piraha)? Roman culture of happiness: prosperity, fertility, power, luck. Also images of simplicity. Early Christian Model of Happiness: 76-77: "worship of sorrow", major symbol about execution, but this is also a path to become blessed, beatitude, makarios (Greek). -- radical inversion of classical and Roman thought. To be happy is to walk in the way of the Lord. Augustine, 96: personal history, symbol of Christian critique of pagan conception, yet also assimilation of Hellenic culture. "To be happy is to be suffused with truth, to 'have God within the soul," to "enjoy God". Note the big development here: positive happiness as a state of Christian joy. Also, Augustine makes the argument that the classical model fails to deliver this sort of happiness. City of God: explaining sacking of Rome, but also a model of Christian Happiness writ large. Also, an articulation of the doctrine of original sin. Need for grace in salvation. Pelagian controversy. Note summary at 105. Along with shaping so much of Christian theology, Augustine shaped the Christian conception of happiness. Small group discussion with Report using Google Form: In 20 minutes, develop a set of critical responses (or a single response) in 200-300 words to the following question: Why are so many people in the culture focused on raising their kids to be like Bob when it looks like Mary has more of the components of happiness in her life? Don't be reluctant to challenge perceived presuppositions of the question. You might want to agree on a strategy such as 3-5 minutes individual study and reflection, 10 minutes to produce the paragraph (5 minutes to get a draft, 5 to improve). Flow (experience sampling) and Seligman's "Pleasures" vs. "Gratifications"; Strengths test used to be at this site: , but it's now a general site for Seligman's work. Paradox of Choice: We say more choices will make us happier, but there is counter-evidence. Schwartz maximizers and satisficers. Whole group discussion: What are some of the promises and pitfalls of an internal vs. external strategy for happiness? Types of happiness: emotional, moral, judgement happiness. maybe a rich background of experience (exotic experience, diverse or challenging experience, luxurious experience, experience of rarefied environments) "ruins" mundane experience. In which case, absence of peak experiences is not a problem. Another way of putting the R&L problem: When R&L give something an 8 is it like what you experience when you (presumably as someone with broader and more diverse experience) give something an 8? Drawing a conclusion: Our relationship to our judgements about happiness is changed by our experience of happiness and vice versa, creating a kind of ambiguity in intersubjective assessments of happiness. Small group discussion: Thinking about R&L and "experience stretching" and "language squishing", what are the major variables that affect whether two people are having getting the "same hedonic effect" from an experience or different effects? Can enriched experience (luxury, peak experiences, exotic experiences) "ruin you"? Does connoisseurship pose a risk to happiness? Does the "moving targets" problem come into the picture here? endorsement -- some difficulty understanding this: not a judgement, but a feeling from satisfying criteria you accept as counting toward the claim, "my life is positively good"
1. Do peak experiences matter to our overall happiness? Won't we just fit our experience to our language? 2. How does the evidence of our difficulty in comparing experiences affect the problem of understanding happiness? 3. How universal is Haybron's model of emotional state happiness? 4. Does Haybron's model keep Hs and Hl separate? The last part of the Gilbert chapter involves a "meta-theoretical" discussion. Philosophical investigations often raise meta-theoretical problems. metaphors from Plato and Buddha. Training metaphor in both. Plato's horses: rational and irrational desire. H's: elephant and rider. point: reason-based metaphors for consciousness don't explain our funny behavior with respect to our well-being. We seem more conflicted than a reason based model would suggest. Akrasia  -- csness is not univocal. You can try to make reason speak for you, but knowledge of the brain suggests that's the wrong way to talk. Left vs. Right -Michael Gazzaniga, collected evidence on split brain patients (severing corpus collasum to reduce seizures), controlled experiments with patients report of l/r brain function. split brains in everyday life... Why does this matter if you don't have a split brain??? "confabulation" - implications for our picture of csness. reminder that lateralization doesn't negate coordination. Consciousness and coherence are an achievement! Small group discussion: What is the importance of "keeping the brain in mind" while thinking about happiness? Is there room for skeptical doubt about it? Consider the potential importance of each of the features of the brain Haidt discusses for thinking about happiness? Determining that something is scary comes before understanding it. (That's scary.) automatic processes can help or distort our preferred reactions. Maybe you can be happy and "not know it" in the sense of not being aware that this (state, experience structure, etc.) is normal to happiness. Capilano Bridge Study -- fear and arousal. reading without awareness. you can have an experience and not be present to it or aware of it. p. 63: "They (alexithymics) seem to have feelings, they just don't seem to know about them." The educated are slightly happier (on PA, not reduced NA). Effect weak in US. Data suggest the education effect is greater in poorer countries. Control for income and job status effects and there is still a slight effect from education. [From personal achievement? Finding enduring sources of flow and pleasure?] But income and job status account for most of the education effect. Note 356: social class predicts a big bundle of goods that also have measurable happiness effects: housing, relationships, and leisure. Also, diff classes DO different things. 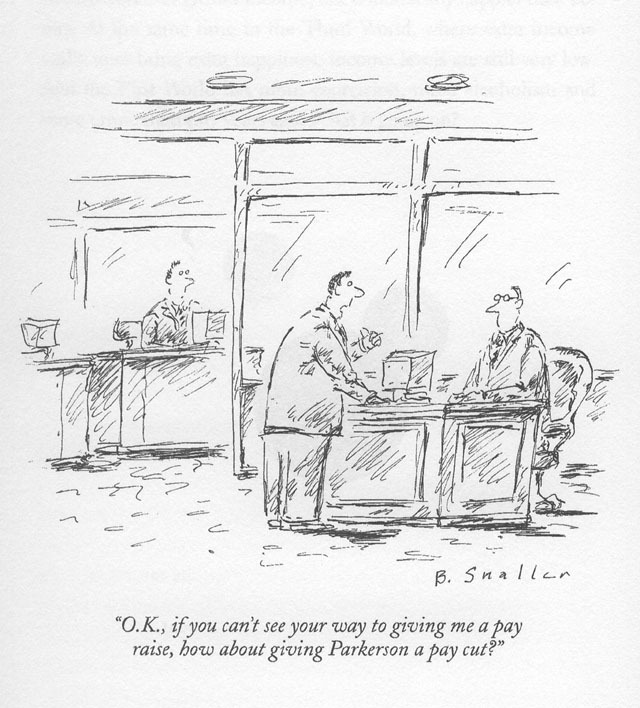 Bradburn pay raise studies in '69. 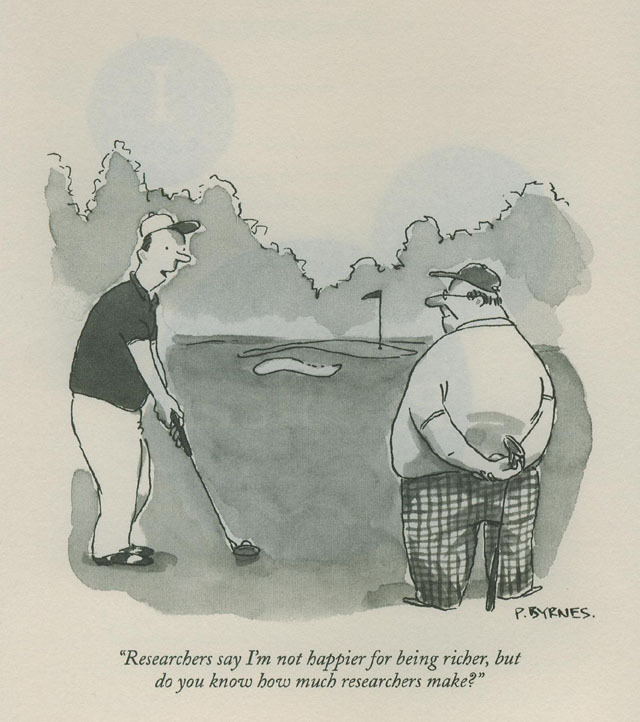 (see cartoon) Inglehart studies in 90's: people who say their $ situation improved also report high satisfaction. Might be interesting to look at research comparing marriage to other types of social support systems. Why are people in your age group delaying marriage? Is it making them happier? Unemployed significantly less happy: "The unemployed in nearly all countries are much less happy than those at work. Inglehart (1990) found that 61 percent of the unemployed were satisfied, compared with 78 percent of manual workers." Leisure effects observed in lots of contexts (social relations from work, adolescent leisure habits, even a short walk. Sport and exercise include both social effects and release of endorphins. Like religion, leisure activities have multi-faceted effects on happiness. So far we've been talking alot about "happy vs. happier," but we now we need to start tracking qualitatively different forms of happiness. Cultures give us a way to look at this, but Gilbert's discussion of the interpretive power of the mind. 1. Measurement Issues -- gloss on "artifacts" as measurement problems. Example: different ways of administering a survey, moment to moment variation affecting results. 3. Scale structure invariance -- non-technical version: what if the terms used in happiness surveys have different "weights" or relationships with each other and with happiness? Some evidence of scale invariance. (Note that a validated construct, such as LS/PA+NA, might be the basis for showing scale invariance. Cf to Gilbert. After accounting for measurement and methodological issues, there are real and substantive differences in well-being across nations. While wealthier nations are generally happier, there are complexities to the causal model. National income correlates with non-economic goods such as rights, equality, fulfillment of basic needs, and individualism (list at 436). These factors have effects on both SWB and income that have not been isolated. (at 441: real ambiguity about causal paths in this analysis: is it wealth or the correlates of wealth that are causal for happiness? Thought Experiment: the Nazi's won, but they really know how to boost GDP. Could you imagine the society being just as happy? Individualism correlates with higher reported SWB, but also higher suicide rates. Collectivists may be working with a different model of happiness or just a different attitude about its importance. (Carol Graham, Happiness Around the World, is the main successor research that I'm aware of. 1999 vs. 2009). Individualism is linked with wealth, so hard to separate effects. Note specific differences in valuation between individualist vs. collectivist culture. (442) Problem (I think): SWB is more salient to individualists. Small Group discussion: Do you see the data on individualism and SWB supporting the idea that individualism (along with the political and economic culture is clusters with) is a better universal strategy for happiness or supporting the idea that individualist and collectivist cultures are pursuing different kinds of happiness? Two highly confirmed results: Memory fills in. We don't typically notice it happening. Word list excercise. 80 -- literal and metaphorical blindspots. experiments with interrupted sentences. We fill in. We experience the world as if our interpretations were part of reality. We do not realize we are seeing an interpretation. We fill in details: imagine a plate of spaghetti. Very important for thinking about how we fill in the future. We carry out the exercise of imagining, and even make estimates of satisfaction, but the result depends upon which of the family of experiences picked out by "plate of spaghetti" we have in mind. closes by giving you the narratives that make sense of the Fisher/Eastman comparison. More cases of lives that require narratives to understand: Moresse "Pop" Bickham. Note what Bickham says. It's possible that Bickham has deployed a powerful version of the "internal strategy". Claim: (33) There may be a diff between being satisfied with your life and judging that it is going well. Comment: Bickham is the extreme case in which its hard to get our intuitions around the idea that Hs and Hl could go together. But let's do our own investigation of this. That's a puzzling definition since early he convinced us that you "satisfied" and "going well" can be judged separately. Claim: It's a mistake to call life satisfaction a hedonic good because it is "not just a question of pleasure"
Comment: This doesn't tell us that it doesn't also involve a kind of feeling. The fact that it involves judgement doesn't mean emotion isn't involved. Small Group Problem: How do you make life satisfaction judgements? How will you decide if your life is "going well" in the coming 2-3 years? Can you be satisfied with your life even if some aspects are not going well? When you think of what is good in your life, do you experience a kind of affect? they are global judgments of complex sets of events over time. too reductive a judgement to make 1 - 10.
determining "well enough" is pretty subjective (variable). -- maybe, but that could be explained within the "goal-achievement gap" model since we're always "resetting" in one direction or another ("Things won are done." or "I guess that's not working") recall point about hedonic structure of this. most people seem to be able to assert satisfaction with their lives independently of whether they were "choiceworthy"
For Haybron, this implies that Hl judgements are basically much less relevant to assessing happiness than emotional states. He even suggests with the Calcutta workers reports that they are not grounded judgements. Short Writing Assignment due this Sunday at midnight! It seems like avoiding the experience machine requires you to accept some kind of objectivity into your theory of happiness. How do you do that given the apparent variation in things that make people happy? What are some of the best reasons to be skeptical about our ability to make the kinds of judgement and comparisons that would allow us to predict what would make us happy? Are there also reasons to be confident about our ability to know and move toward happiness? How do you explain differences in life satisfaction and hedonic balance across nations and ethnicity? Do the best explanations suggest to you that positive and negative affect are fixed? Format your answer in double spaced text in a 12 point font. Please indicate which question you are answering. Save the file in the ".docx" file format using the file name "Short Happiness Writing 1". Most global philosophical cultures have deep philosophical commitments to some form of this principle. Key Claim: If you realize your nature, you will flourish and be happy. Start with some general introductory discussion about the stoic viewpoint, considering questions of clarification at first but then moving into strengths and weakness. Try to formulate what you take to be insights or oversights of this counsel for happiness. Is the implicit psychology of stoicism compatible with what you understand about human psychology? Try to come to some assessment of stoic advice for happiness. When you are working with historical philosophies, you should try to avoid treating the theory as a fixed position, even if it is sometimes articulated in terms of extreme examples or strong distinctions. It often turns out that getting insights from a classical theory requires you to modify it in light of new knowledge or reinterpret its emphasizes. Fundamental distinction between Katastematic pleasures and kinetic pleasure. Epicurus is telling us that while we think pleasure is endless stimulation, but it is really found in satisfaction, which is a state of non-desire (rather than lack of desire). Consider the framework of robust hedonism, Epicurean hedonism, and Modern Epicureanism and then try to figure out which of Epicurus' ideas you would recommend incorporating into a modern reconstruction of hedonism. Also,today, like last week in the course, we practice the time honored technique of rummaging through great historical philosophies for insight and things to carry with us. 73ff: Sources of evidence for possibility of "Stoic Joy": children (whose experience is too new to have adapted deeply), people who survive disasters (catastrophe-induced transformation). Negative visualization doesn't have the drawbacks of catastrophe induced transformation. 79: projective visualization: "the asymmetry" (found in stoic, epicurean, and buddhist thought) -- use the asymmetry in your response to your own vs. others' loss as a way of altering your response to your own loss. Small group discussion: Assess negative visualization as technique within stoicism and then as a more general practice. Is it plausible that it could reverse adaptation and produce states of joy? Claims: We do have complete control over goals, opinion, and character (take care of your hegimonikon, your guiding principles, theos in you!). Problem of Stoic cosmopolitanism: Why would a stoic set goals that would threaten his/her tranquility? (quick answer: because it won't if she's a good stoic). Small group question: Does the trichotomy of control and internal goal setting solve the problem? From Samkhya dualism: everything is a mix of prakrati and purusa. 13: "The basis of spiritual liberation in the Yoga school is a profound experience of the evolutionary process whereby spirit becomes enmeshed in material nature." Look for and share experiences you have had that might be examples of the kind of untanglement and amplification of thought and emotion that Patanjali was thinking about when he suggested we pursue "seedless" thought. In what circumstances do you find that thought "feeds on itself" or becomes persistent. How does social psychology and phenomena such as gossip or drama create such situations? What practical attitudes and behaviors (imagine scenarios) might a person influence by a yogic model of happiness pursue in such situations? Story of the deformed sage, Ashtavakra. Look beyond physical. note Fahri talks about "spiritual fitness". Does this make sense? 62: cultivating "metta" - loving kindness meditation. Basic goals of meditation: cultivation of awareness and "control" of sense and feeling. (Control: quieting, not being at the mercy of psychological processes and processes of desire.) How does meditation do that? Considering Buddhism primarily as a psychological theory of suffering and happiness, what are some of its keys insights according to its adherents? (3-4) How is mindfulness supposed to help us avoid suffering and promote joy? What are you most skeptical about in thinking of Buddhism as a happiness philosophy? Does your group worry, for example, that that egolessness Buddhism calls for might make it hard to be ambitious? other correlates. Hl. health, optimism, exercising, empathic, prosocial,forgiving helpful, supportive, less materialistic. Correlates of gratitude: greater LS, hope, less depression, anxiety, envy, prosociality, empathy, forgivingness, less focused on material goods, more spiritual and religious. Later (481) - promotes positive memory bias! Option 3: Gratitude and Journal. This exercise involves keeping a gratitude journal for a period of three weeks. You don't necessarily turn that in (it's likely to include some personal things), but you do turn in three journal entries (one for each week) based on the guidelines for this exercise from the leading researchers on this, Emmons & McCullough. Your daily gratitude journal is both an occasion for expressing gratitude and reporting moments during the day when you engaged in a gratitude behavior (something more extended or involved than "thanks!"). Gratitude behaviors include all of the verbal behaviors by which you can show appreciation to others or in the presence of others for benefits enjoyed. This ranges from telling people explicitly what you appreciate about what they did for you. (examples: call centers, someone correcting you or informing you, someone doing more for you than they had to.) G behaviors can include requesting a benefit (Could you help me with this?...) that you already intend to be really grateful. "I'd be ever so grateful if...."
Savoring and Connoisseur-ship: Does Savoring require (or is it enhanced by) connoisseur-ship? How does that square with Epicurean simplicity? Note how you might use a modified Epicureanism to include some insights about complex savoring. This exercise is based on the work of Fred Bryant, who offers practical advice about creating and evaluating savoring experiences. You'll come up with three experiences and journal on each. Schedule this for the 2-3 weeks after the topic comes up in class. The goal of each journal entry is to describe your savoring event, what you did to make it a savoring event, and whether it led to a noticeably different experience of pleasure and satisfaction. Your grade does not depend upon finding positive results. Leave 10 mins to debrief with meditation practicum participants. Theoretical position, p. 21: In story of woman with two jobs: looking for patterns of human commitment to a life. Wants to ask less for self-reports of happiness and more about the moods and affect that might be functionally related to happiness. It may be especially evident in a life of commitments and goals which reduce "psychic entropy." absorption in task, dynamic feedback. "All in." Small Group prompt: Report experiences of flow. If you were trying to get flow to happen more reliably in your life, what steps would you take? What are the obstacles to states of flow? What is its relationship to happiness in your view? Does a happy life have to have flow? Contemptus Mundi: 13th-15th century: characteristics. Life in the European Middle Ages. Bronzino's Allegory of Happiness -- connection to earthly happiness evident. "This complex allegory represents Happiness (in the centre) with Cupid, flanked by Justice and Prudence. At her feet are Time and Fortune, with the wheel of destiny and the enemies of peace lying humiliated on the ground. Above the head of Happiness is Fame sounding a trumpet, and Glory holding a laurel garland. This Happiness, with the cornucopia, is a triumph of pink and blue; the naked bodies of the figures are smooth, almost stroked by the colour as if they were precious stones - round and well-defined those of the young women, haggard and leaden that of the old man." Reformation - The reformation can be seen as a huge step toward bring personal faith life and spiritual happiness together. Locke also important to history of happiness for political thought, which supports democratic republicanism over monarchy -- note trending models of happiness toward control of one's life at personal and political levels. Note connection at p. 182. "pursuit of happiness"; physiological thought on happiness;, but even that pleasure can enhance spirituality. 185: "...Locke had legitimated the search for happiness in this life, grounding it in science, human impulse, and divine order." How does the Renaissaince re-discover and create a new idea of the Christian self? How do new models of the self, such as we find in the Reformation and in Locke's thought set-up the idea of a future secular self? In today's history reading we have our best opportunity yet to see the culture and happiness interact. We'll need to have some kind of framework for thinking about culture and the unique historical disruptions and experiements that take us from Reformation and Enlightenment culture to the American cultural experiment on happiness. Table 2: Quality of Experience in Everyday Activities. review. Where are opportunities for +affect at work, in maint. activities, and leisure? Do we correctly anticipate the "affect profiles" of different activities? Schizophrenic patient and ESM: noticing affect patterns can have practical value. Note comments on solitude, 41-42. modern life: in and out of solitude. hypothesis: interaction makes us happy because it structures psychic energy by external demands. some theorists talk about the "ethics of the face". (not in text) some research on American's social networks (people you could call for a favor) are smaller than other western cultures. Small Group Discussion: How well does C. describe the "affect profiles" of different daily activities? What strategies do you use (control of environment, rewards, food, etc.) to manage affect in the rhythm of everday activities? Where do you get caught short? p. 322ff: How religious were Enlightenment thinkers? 18th century writings link happiness, Christian life. Jefferson: not pious, but Jeff bible, liked Unitarianism, exemplary Am.Enlightenment religion: Christian ethics good for promoting happiness. The American Model of Happiness: Libertarian over civil republican. High religious participation. 324: Tension in American Model seen in distinct strains of Libertarian (rooted in freedom of conscience and religion) "freedom from" vs. Classical Republican (rooted in a duty to civic participation and contribution to the public good) "freedom to contribute". really about the dynamics of equality, freedom, and democracy vs. community and social values. U.S. a big experiment. Tocqueville also praised Americans for self-reliance and a sense of "enlightened self interest" -- realizing that it is in your self-interest to be concerned about others. And that, Tocqueville concluded in a famous line, "is the reason for the strange melancholy often haunting inhabitants of democracies in the midst of abundance, and of that disgust with life sometimes gripping them in calm and easy circumstances." praised enlightened self-interest of americans. 344: image of John Stuart Mill reviewing Toq's essays and longing for democracy in Europe. also in Mill (and Butler), the problem of indirect happiness (similar to puzzle about enlightened self-interest). Mill's passage 348 breaking with simple Benthamism. Weber Section: 355 "In the Protestant anxiety over the fate of individual salvation, he argued, lay the motive force behind an impetus to capital accumulation, regarded as a sign and partial assurance of God's blessing. Combining ascetic renunciation, a notion of work as divine calling, and a critically rational disposition, the Protestant faith, Weber argued, brought together nascent capitalism's essential qualities: the restriction of consumption in favor of the accrual of capital, and a religiously consecrated ethic of discipline, delayed gratification, industry, and thrift. Consider the range of types of relationships we can have, including solitude, virtual, and spiritual relationships. What is your basic model for relationships in general? For close relationships? Is the model for love and intimacy changing in a highly individualistic, advanced capitalist culture such as the US? From a paper, "The Ethical Importance of Close Reltionships" -- Interesting paper from a colleague I met this summer, trying to describe the values of close relationships without adopting a taxomony of relationships that automatically privileges life time monogamy. Consensuality, reciprocity, non-instrumental treatment, shared responsiblity, sharing self-narrative truth, trust (related to vulnerability). Small group: Test his view at a general and specific level. What are the challenges for individualistic culture for meeting his criteria for relationship? What are the specific challenges you and your peers face in negotiating career, relationship, and family? Should we be trying to recover traditional forms of social life (intergenerational households, strong expectations for lifetime partnership, social network "enforcing" relationship stability) or moving on and accepting that there are new forms of the self emerging that will coincide with ways of managing relationship (eliminating guilt from relationship change, term relationships, career-first strategies)? Lucas study: Marriage itself give you a small predictable happiness bump. Married people may be happier than average because happy people are more likely to marry than terribly unhappy people. Big example of question of "locating yourself" in relation to the average. Also, in setting expectations. Bella DePaulo book, Singled Out - part of reassessment of imperative to marry. Philosophical Method Notes: Now that we are deep into a discussion of culture and happiness, it makes sense to ask about how culture shapes our conception of love and, while we're at it, what is love anyway? What is it that culture is shaping when we say culture shapes our conception of love? After answering these simple questions, we get to ask about the future of love. Given that our current conceptions are so recent, and so much else is changing, it's reasonable to think that more change is on the way. Again, traditionalists and neophilics might take different lessons. If so, is it possible to be satisfied by the love we receive from the world? Bowlby's children and orphans. hears about Harlow's work. Duck bonding is news to these researchers. Why think that attachment theory explains love relationships? Thesis: adult romantic love grows out of the same psychological system that attaches children to their mothers? Evidence that romantic partners do become attachment figures: same pattern of response to loss as to loss of parental figure. READ bot 119. Romantic love might be a repurposed "care giving and guidance system" based on maternal/paternal care. But why is human love so different: hidden ovulation, long gestation/maturation of young...? Hypothesis: evolutionary advantage, in humans, for strong pair bonding, but also response to a highly competitive society in which you need to manage personal growth and development throughout adulthood. Brooks should help us explore the problem of the relationship between "love and the 'culture of love' by focusing on the non-reflective dimension of our evolved psychology that kicks in on a potentially romantic date. Look at some of the details together: dress codes, body regimens (mens and womens), head cant, hair flip, chest heave. Similar behaviors for Harold. Related link: Listen to the Michael Levitan segment on This Amercican Life's episode #552: Need to Know. What would it be like to have been raised not to follow any of the conventions needed for dating? In a discussion of the relationship between the "culture of love" and love, try to determine some of the attitudes and beliefs about love that you all endorse (Werther isn't a hero, most people want love to last, etc.,) as well as places where there are reasonable differences. Does the "soulmate" view linger even after we tell Werther to get a therapist? Does giving love a naturalistic basis (in biology and attachment theory) ruin it or just demystify it? Drawing on what you know about how people are managing intimacy in 21st US culture, what trends or changes do you predict? Are these attractive possibilities? What are the consequences for the view of love you take in your theory of happiness and the importance you give it? Fenton Johnson's essay raises the question of whether we should view the capacity for enjoying solitude as a sort of happiness that could be cultivated and which you might get better at. Let's compare some of Johnson's reference points (monasteries, for example) with the possibilities for solitude today. Haidt is telling us about some of the psychological mechanisms that may enable us to experience relationships with enobling acts, people, and divinities. This raises the question of the extent to which these kinds of relationship might be sought out as part of your happiness strategy, and therefore have a place in your theory. Research on disgust. Why do we experience disgust? 186. Purity opposite impulse from disgust. Disgust brings us "down". Disgust emotions evolved from protecting the mouth to protecting the body. Purity and defilement generally. Cites approvingly: Eliade, The Sacred and Profane -- perceiving sacredness universal among humans. 189: Interesting examples: handedness, space in houses. Examples from your experience? 196: wants to see if elevation can be distinguished from other forms of happiness (such as being entertained). research with student Sara Algoe, (three conditions: doing something good for someone, saw someone tell a joke, saw extraordinary non-moral performance) results seem to separate out different responses: moral elevation vs. response to non-moral excellence like basketball player. Vagus Nerve theory -- operation of vagus nerve, relationship to oxytocin. Since oxcytocin causes bonding rather than action, this theory might explain the lack of evidence in an earlier study that elevation leads to action. Tell opening story from Paul Zak's The Love Molecule. 1. Review some of the work for SW1 by following this link  to the folders for SW1 work and by using the score information at this wiki page: SW1 Animals and Scores. As you read some of this student work, please also bring up the rubric Assignment_Rubric that was used in the exercise and will be used in this exercise both by you and by me. Try to notice how you would apply the rubric, using this student work as a practical example. Choose one idea from one of the classical philosophies we have studied (Stoicism, Epicureanism, Yoga, Buddhism) that you plan to incorporate into your theory of happiness. Explicate the idea and show why it is important for the way you are thinking about happiness. We have been studying a number of ways that you might qualitatively enhance your happiness by increasing the experience of gratitude, savoring, flow, or elevation in your life. Choose one of these enhancements that you plan to incorporate into your theory of happiness. Explicate the idea and show why it is important for the way you are thinking about happiness. Include research evidence, if available. We have been discussing the challenges of realizing the benefits of relationship in a competitive individualistic culture, along with trends in relationship and different types of relationship, including solitude. How do you understand this problem and what strategies seem promising to you? 3. By midnight Friday night, November 17, please review and score four essays. Display the Assignment_Rubric and review. Go to Link for Student Work and view spreadsheet with Saints, Animals, and Questions. Find the animal next to your saint name and review the next four animals in the alphabetic listing. If necessary, you will loop to the top of the alphabet to complete four reviews. You should only review work on the same question you wrote on. Use this google form Happiness Short Writing 2 Peer Review to review your peers. You will submit one record for each review. 4. By midnight Monday night, November 20th, please provide "back-evaluations" of Peer reviewers. After receiving your peer reviews and scores you will be asked to evaluate the helpfulness of each review. The points from the back evaluation will be added to your score. A google form will be used for this. Note from the gym/thirst study: emotional contagion from one experience to another. The "availability heuristic" comes in here again. Priming. practical advice: you can see how mindfulness might be part of the remedy here. We spatialize time because it's an abstract thing and thinking of its spatially helps make it concrete. But that makes some things easier to imagine in the future than other things. "Time is no grapefruit"! Spaghetti satisfaction predictions under condition of multi-tasking, p. 136. multi-tasking raises the effect of hunger and keeps people from making distinctions (morning/afternoon) about their experience. Another interesting implication for mindfulness, assuming a quieter and more mindful person would be less vulnerable to these distortions. Famous Khaneman and Tversky "mental accounting" study -- (140) theater tickets and twenty dollar bills. "If negative events don't hit us as hard as we expect them to, then why do we expect them to?" Interested in discrepancy between cs forecast and actual experience. Importance of context, frequency, and recency in identifying information and salience. Necker cube. Definers and self-rating study (159). importance of relative complexity of experience (over visual illusions). Complexity creates ambiguity which we exploit with narrative Kale and ice cream study, 159. Our immediate experience can change our relative perceptions of arrays of other objects and experiences. major thesis on 160. Once our experience becomes actual, our uncs goes to work renarrating the story with positive bias. a kind of "psychological immune system" (psychological investment system). (recall the poster study.) Interesting practical advice follows: You might be able to choose a more or less positive way of looking at situations that have ambiguous interpretations. You are trying to strike a balance between disabling self-criticism and panglossian self-delusion.see 162. Looking forward/backward (recall examples from 153, in which we over-predict the effect of negative events): asymmetry in judgments of events when looked at prospectively and retrospectively. Thesis: We assume that the views looking forward and backward are symmetrical, but they are not. You won't value things the same way once events transpire, but the process of revaluation is largely hidden from us. Regret: when we blame ourselves for outcomes we might have anticipated. A kind of "personal liability" emotion. Sometimes useful. Problem of the number of things you didn't do. (research on p. 179: suggesting that we regret omissions more than commissions, though they predict that they'll regret commissions more.) Why is this? Gilbert's thesis: It's harder for the immune system to re-narrate an event that didn't happen. Psychological Immune System: Very bad things trigger it more than slightly bad things. "it is sometimes more difficult to achieve a positive view of a bad experience than a very bad experience. Concept of "psychological investment" in initiation rites study (181). Triggers at work in the negative feedback study (182). Problem of intertemporal comparison: Who's to say that status pleasures aren't as important to us now as basic satisfactions were to our poor predecessors? It is repugnant to think that desires never lose their urgence, but maybe that's the case. Flaw in the view of someone who accepts this case: If our desires and wants are "contrived by the process of production", they are not original with us and therefore can't be "urgent" for us. The whole case for accommodating business production (through infrastructure, tax breaks, etc.) falls apart if the production system is creating the needs. Section 3: advertising and salesmanship (no social media yet). It's a problem if the producer makes the goods and the desire for the goods. Note that is calling into question the idea that the consumer is really autonomous. "independently determined wants"
Bruni & Zamagni, Chapter 1: What is Civil Economy? With globalization, we've stopped talking critically about capitalism and simply treat it like a fact of nature. There are still lots of critics, but they don't agree and leave is trapped, as if still in the womb. "Civil Economy" refers to the idea that we ought to assess the performance of the economy in relation to its effect on the "civitas" the citizens and community. (Historically connected to a "golden age" of thought in economics in the 18thc, 2nd half, but also, to earlier Roman concepts such as "felicitas publica". But civil economy isn't an alternative to capitalism. More of a "laboratory of thought" to help us tell a different story about relationship of capitalism to the common good. Not about the freedom of the individual from the society, but not anti-capitalism. The American Model: Anonymous markets, communities compete for businesses (Newport smelter). Financialization of the economy, finance capitalism: fr. Wiki: "Finance capitalism or financial capitalism is the subordination of processes of production to the accumulation of money profits in a financial system. Financial capitalism is thus a form of capitalism where the intermediation of saving to investment becomes a dominant function in the economy, with wider implications for the political process and social evolution: since the late 20th century it has become the predominant force in the global economy, whether in neoliberal or other form. "With the financialization of the economy has come the idea that speculative finance creates much more wealth, and far more quickly, than productive labour. "14 "Exaltying the merits of themarket, narrow conformist hinking reached the conclusion that the world is what markets make it to be, and not citizen, not even governments, should have the power to correct it s course." 18. Need to bring demomcracy and capitalism into coherent, cooperative relationship. Arguably, global capitalism has weakened the power of nation states and communities. Competition of communities for business. Bruni & Zamagni, Chapter 6: Why GDP is not enough? Thesis: We need additional measures of well-being to add to or replace our reliance on GDP. Analogy of multi-stage cycling races: There are many things to compete for in addition winning the overall race. GDP is just the sprinter's jersey. Promoting SWB is the overall goal. Historical discussion: Smith's Wealth of Nations not just about individual production and riches, but well-being. Examples of texts from Neopolitan School Genovesi: "Work for your own interest, of course, but don't make others miserable by your gain, work also for public happiness. ....p. 88. Adds "public happiness" to "liberty, fraternity, and equality"
1. We have a shared interest in economic activity that satisfies our community's needs. 2. Our primary cultural theory for how to do that is to increase GDP and rely on "non-intentional cooperation" to meet needs through self-interested economic activity. 3. Some critics of this approach agree that market economies important advantages over non-market mechanisms, but argue that markets can be assessed with better measures than GDP. 4. Happiness research allows communities to assess flows and stocks of goods, both economic and non-economic. 5. The same justifications for using political and economic policy to maintain GDP growth apply to more complete measures of subjective well-being in communities. C. Therefore, community development should be guided by both economic growth and broader measures of well-being. Macro-Economic Policy and other governmental programs -- Incentives, taxes, and transfers can be used to address public well-being problems (ex. Opiod crisis, super fund sites, urban and rural development). Unemployment policy is a major focus of Happiness and Public Policy research (Frey and Stutzer). Zoning and Business Development -- This often takes the form of requirements and conditions placed on development based neighborhood community development plans. While this is a mainstream activity of government, it is often a lightning rod for political disagreement. Zoning requirements are often experience by entrepreneurs as an unwelcome tax or limitation on productivity. Government agencies focused on community well-being -- Parks and Recreation. In Spokane, for example, Corbin Arts. Parks programming. Philanthropic Advocacy for the Civil Economy -- Civic leaders and organizations from mainstream groups like Rotary, Chamber of Commerce often achieve improvements in a community's stock of social capital. Often business leaders in local communities come to understand that their opportunities might be contingent upon solving local problems. Examples like Riverfront Park, Riverfront Square (maybe), Sustainable Seattle, Tilth (in Seattle) suggest that civic groups can be effective in making intentional community development a product of community consensus (sort of). Employment in the Civil Economy -- Organizations such as SNAP, Catholic Charities, Lutheran Services, Meals on Wheels, etc. can be thought of as part of a civil economy since they generate economic activity around solving social problems. But so also, developers who maintain Section 8 housing projects as a matter of organizational mission. Community development (whether government, foundation, or community based) can be thought of as a distinct sector of economic activity focused by mission on improving community well-being. Frey and Strutzer, "Policy Consequences of Happiness Research"
Effects of unemployment: Research suggesting that unemployment has a negative effect on SWB of both unemployed and employed. Psychic costs of unemployment. Social effects: inequality, crime, disruption of family life. Why would unemployment affect the employed? empathy, fear of economic insecurity. Main point: unemployment looks different when assessed wholistically. Not just about the "reservation wage". Policy implications unclear: The pain of unemployment is a motivator (Psychic costs may be functional.) Artificial job creation might have negative effects on investment. Externalities of Status markets: "People do not value the absolute level of their income but compare their economic standing to others." Positional externalities: Example 1, 2. There is a rationale in mainstream economics for addressing externalities. In this case by taxation and transfer. But again, there are problems. In addition to effect of taxation on growth, people might choose other ways to show status. Some closing remarks and paper workshop. Put your name in the file. This is not a pseudonymous assignment. Format your paper in double spaced text in a 12 point font. Please indicate which question you are answering. Save the file in the ".docx" file format using the file name "My Philosophy of Happiness". Log in to courses.alfino.org. Upload your file to the My Philosophy of Happiness dropbox. Identify Gilbert's main theses and the most significant kinds of evidence he uses to support them. How serious a problem for happiness do our limited abilities to predict the future pose? What practical advice do you have in light of your new expertise from studying happiness? Why is it important to our happiness to think about death? Identify some of the key arguments and lines of thought for answering this question and briefly assess them. What does the history of happiness tell us about happiness? Assess the case for taking happiness studies into account in civic and political life. Should we go beyond a concern with GDP? Is it reasonable to hope for a broad consensus on some of the measures we would want to use to assess the performance of the economy in promoting well-being at the level of the community? Format your answers in one file, using double spaced text in a 12 point font. Save the file in the ".docx" file format using the file name "Final Essays". Please put the numbers of the essays you answered in the file name (e.g. "Final Essays 2 4" if you answered questions 2 and 4). Log in to courses.alfino.org. Upload your file to the Final Exam dropbox. Please feel free to collaborate with each other in identifying relevant content and discussing your answer, but to keep your answers authentic, do not share outlines or text of draft answers. This page was last modified on 8 December 2017, at 10:58.